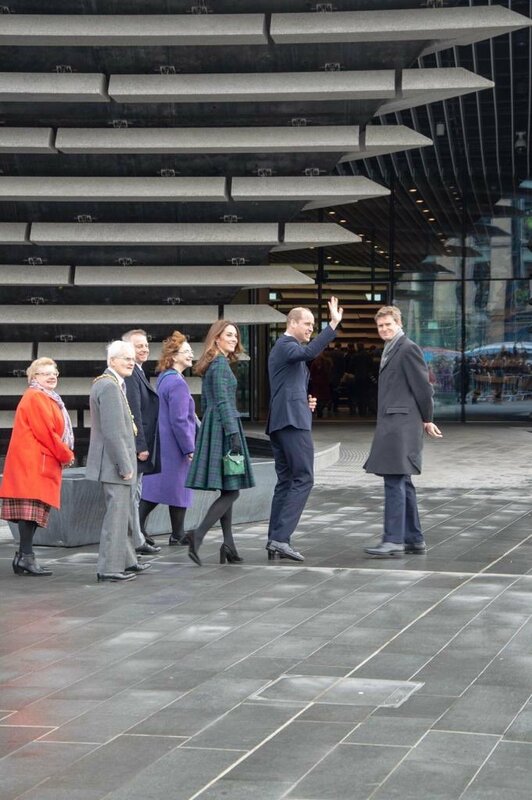 The Duke and Duchess of Cambridge, Prince William and Catherine, were in Dundee Scotland to officially open Victoria & Albert Museum and to meet the employees and their families from Micheline Tyre. 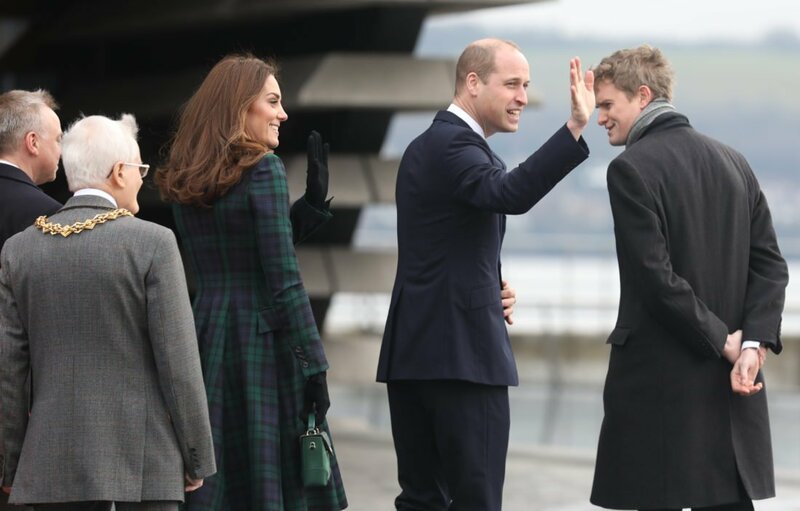 The couple, known as Earl and Countess of Strathearn in Scotland, last visited the city in October 2015. The coastal city of highlands is a short drive from St. Andrew’s University, where William and Catherine met in 2001 and fell in love, and the night before their first official visit in 2015, they stayed at the University. 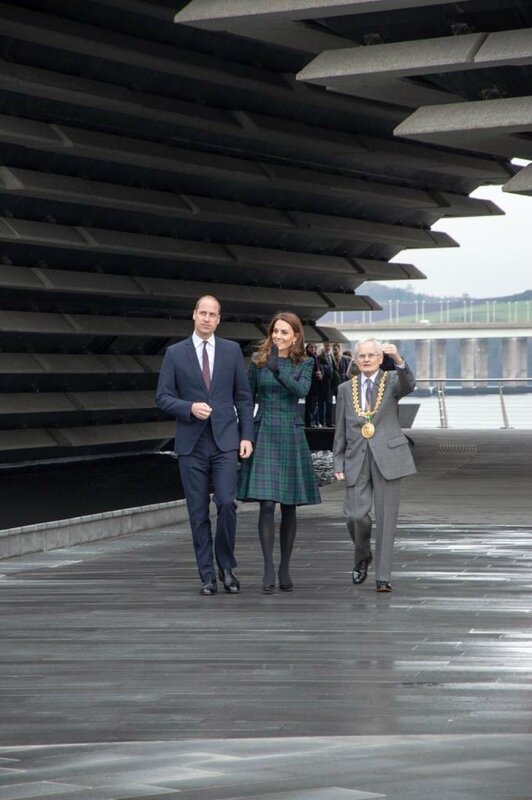 Duchess of Cambridge, who became the patron of Victoria & Albert Museum in 2018, along with her husband Prince William officially opened Scotland’s first Design Museum V&A Dundee. 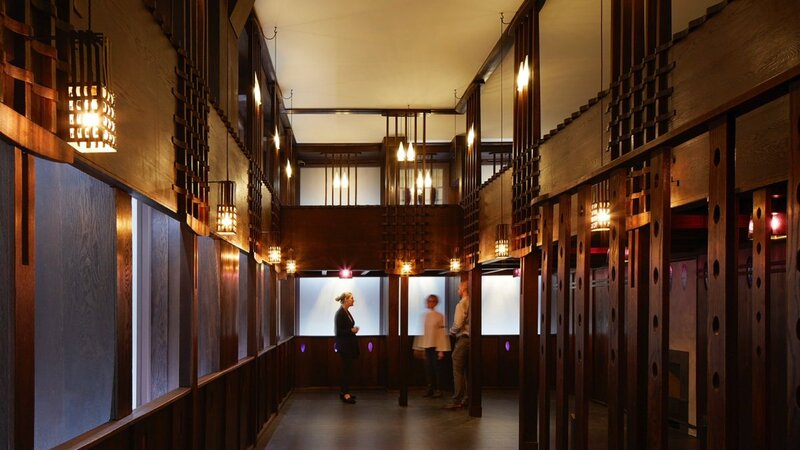 V&A Dundee explores Scotland’s design heritage – its past, present and future. 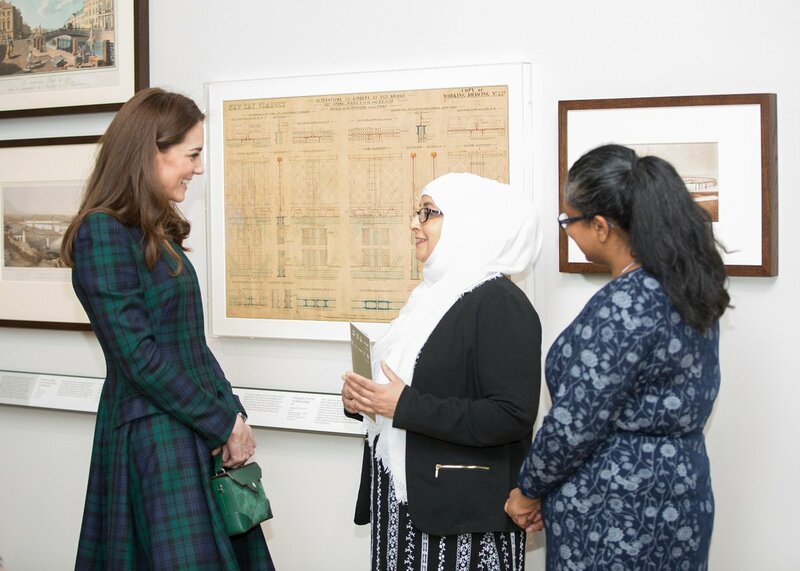 About the visit the Palace said, “The visit will build on Catherine’s keen interest in promoting the visual arts, and highlighting the value that public institutions like V&A Dundee can offer local communities, particularly in the terms of increased accessibility to world-class art and design”. The establishment of the museum was made possible because of the unique collaboration between V&A, University of Dundee, Abertay University, Dundee City Council, UK and Scottish Governments, the National Lottery and Scottish Enterprises. The museum, a major cultural hub at the heart of the £1 billion waterfront regeneration plan, is already bringing significant economic and social benefits to the local area, helping to reshape the city’s future as a hub for creative industries. Opened for public in September 2018, the museum already had attracted 380,000 visitors since then. Designed by renowned award-winning Japanese architects Kengo Kuma & Associates following an international competition, the first ever dedicated design museum in Scotland and the only other V&A museum anywhere in the world outside London, V&A Dundee’s extraordinary three-storey building is itself a testament to great design and provides a place of inspiration, discovery and learning through its mission to enrich lives through design. 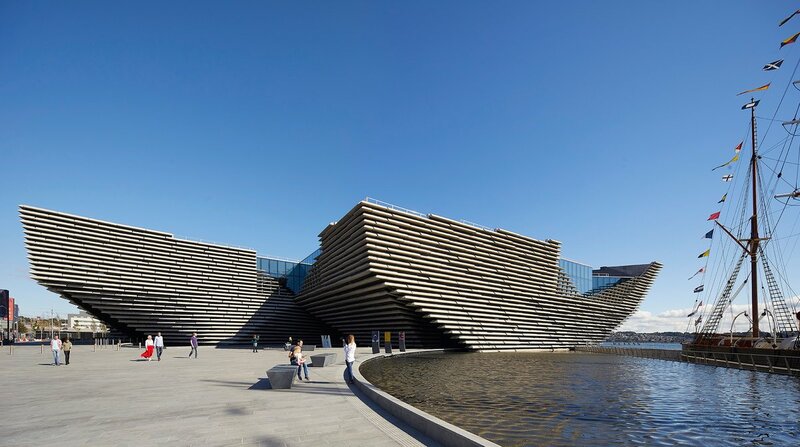 Kuma’s vision for V&A Dundee is that it will be a welcoming space for everyone to visit, enjoy and socialise in – a ‘living room for the city’ – and a way of reconnecting the city to its historic River Tay waterfront. Along with V&A Dundee, Kuma is involved in a number of large, ongoing projects, including arts centres in Besançon and Granada. 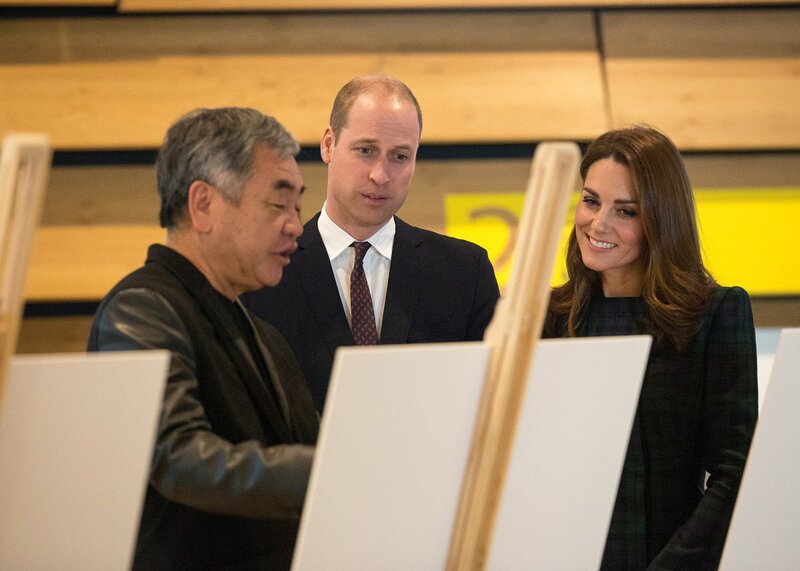 During the visit, William and Catherine met Kengo Kuma. Curving concrete walls (there are no straight external walls) hold 2,500 pre-cast rough stone panels, weighing up to 3000 kg each and spanning up to 4m wide, to create the appearance of a Scottish cliff face. There are 21 separate wall sections. V&A Dundee is an impressive 8,000 meter square building, with 1,650 meter square of gallery space. Beyond its curved walls, V&A Dundee is reconnecting the city with its beautiful and historic riverside.Construction of the building is being led by Dundee City Council, with project management from Turner & Townsend. The total cost of design, construction and fit-out is £80.11m. Learn more about the museum here. 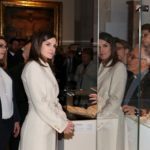 Catherine, who herself is a graduate of History of Arts, fell in love with the museum immediately and told the attendees that she had never seen a museum like this . 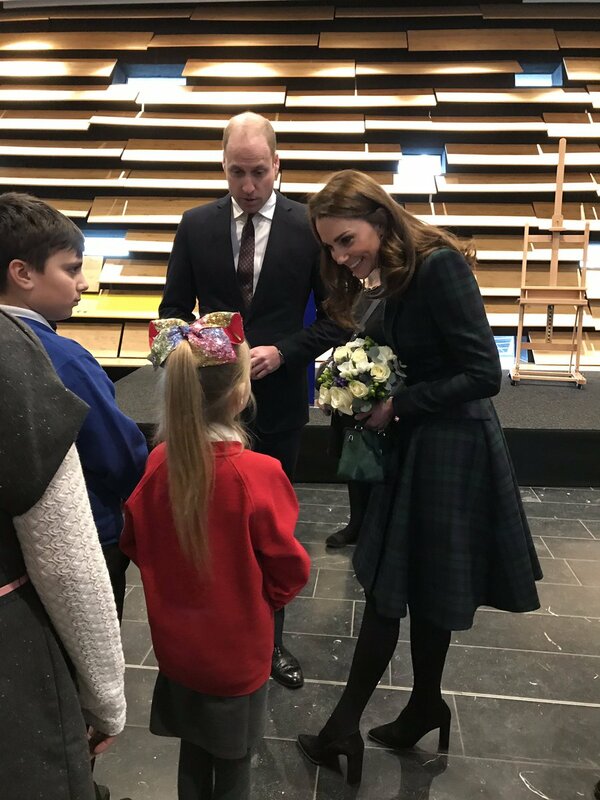 At the museum, William and Catherine met with the representatives from the Young Peoples Collective, who design programmes, and lead activities and tours of the Museum. 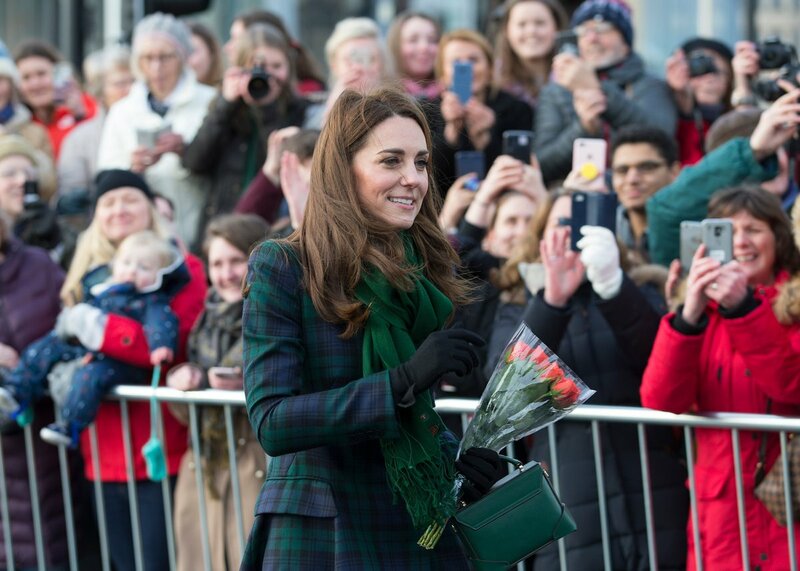 Duchess was presented with flowers by the students of nearby Rosebank Primary School. 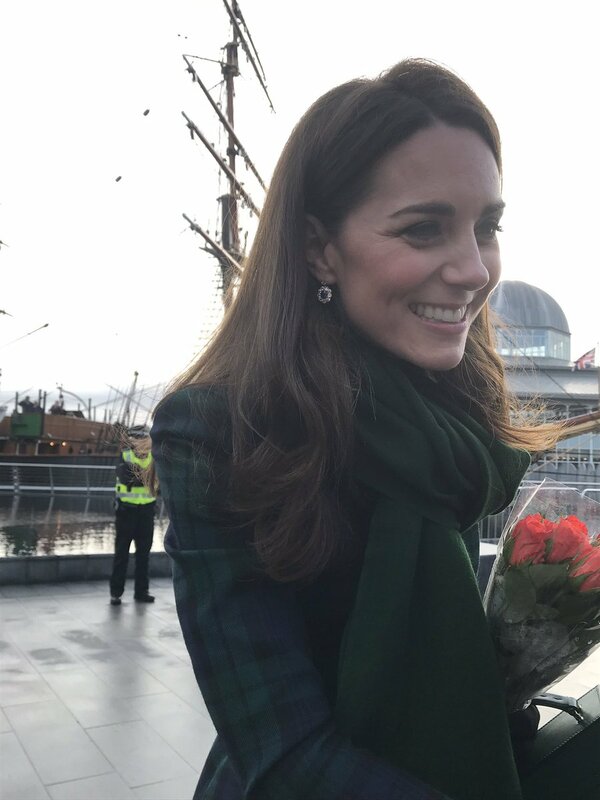 As the patron of the museum, the Duchess of Cambridge gave a short speech celebrating the addition of this major new cultural center for Scotland and the UK. Walking around this world-class space, it’s easy to see how Scotland’s first dedicated design museum is already inspiring the next generation, by providing a new learning space for discovery. I have been captivated by the breath-taking architecture, and the sheer range of design on display. But most of all I’ve been moved by the passion of the people who work here, and the dedication of all those who have helped make this important project to succeed. I believe we should celebrate all our leading galleries, museums, and cultural centres playing a greater role in communities, not just in London, but up and down the countrytoo. The cultural riches of the UK belong to all people of the UK. This is what V&A Dundee has achieved. The partners involved in this project from the local area, Scotland, and the UK more broadly all deserve enormous credit for the way you have collaborated to make this happen. I hope that this Museum will serve as an inspiration to others, by showing how great things can be achieved when different communities all pull together. With this thought in mind, I am pleased to declare V&A Dundee ‘officially’ open. 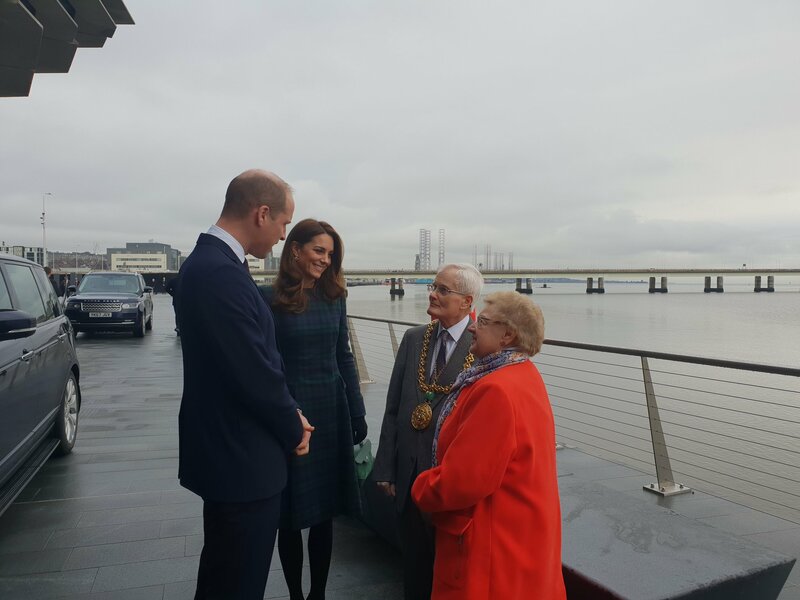 Before departing from the museum, the royal couple met and greeted the members of public at the waterfront. 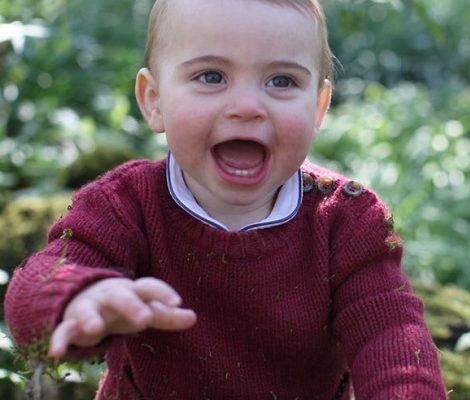 During the walkabout Duchess told a lady that Louis is a fast crawler. She also said that she hope to bring her children to this museum one day. The mother in Duchess could not help this beautiful moment. 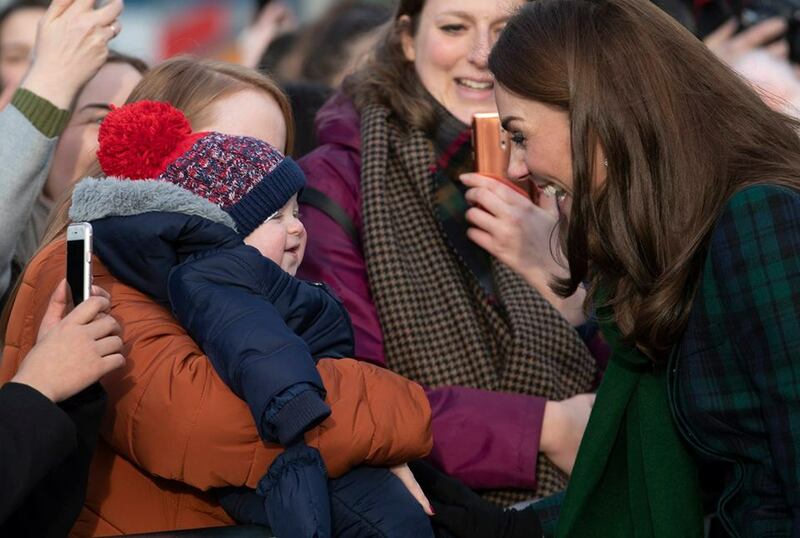 It seems just like all of us this cute little girl also loves Catherine’s hair. A video of the cute moment. Lovely Danielle Marr on Twitter shared this beautiful shot of Duchess that she clicked her self during the walkabout. Next stop of the day was the Crescent Community Centre, where the couple met Dundee Michelin Factory’s employees and their families. The tyre factory is set to close down in the mid of 2020 with the loss of 845 jobs. 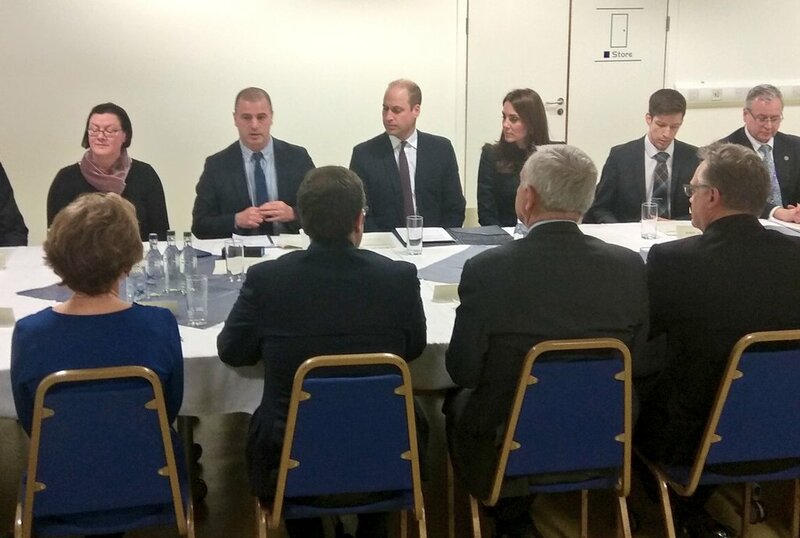 William and Catherine heard first-hand how the factory’s planned closure is affecting them. Established in 1971, the company announced its closure in November last year because of the serious difficulties it is facing due to the changes in the market for car tyres and competition from low-cost, entry-level products from Asia. 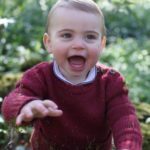 This part of the royal itinerary was received incredibly well by the media and public. 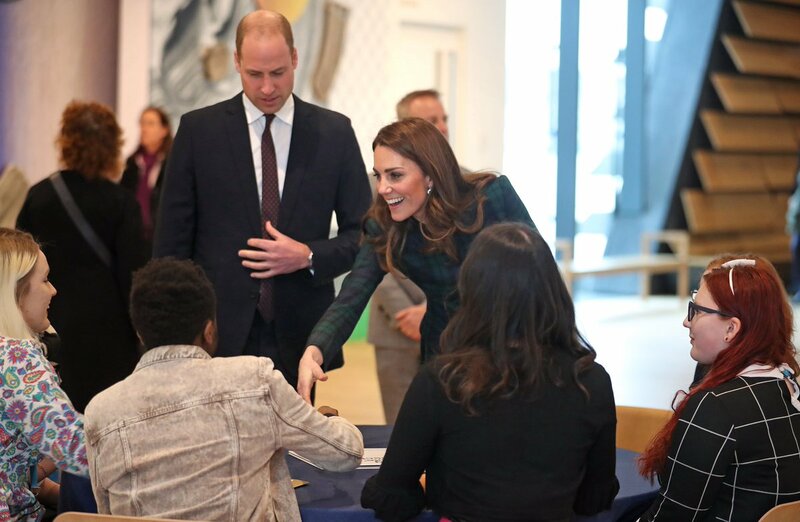 It is really important that members of the Royal Family are taking initiative to learn and promote the British Economy through this sort of visits. 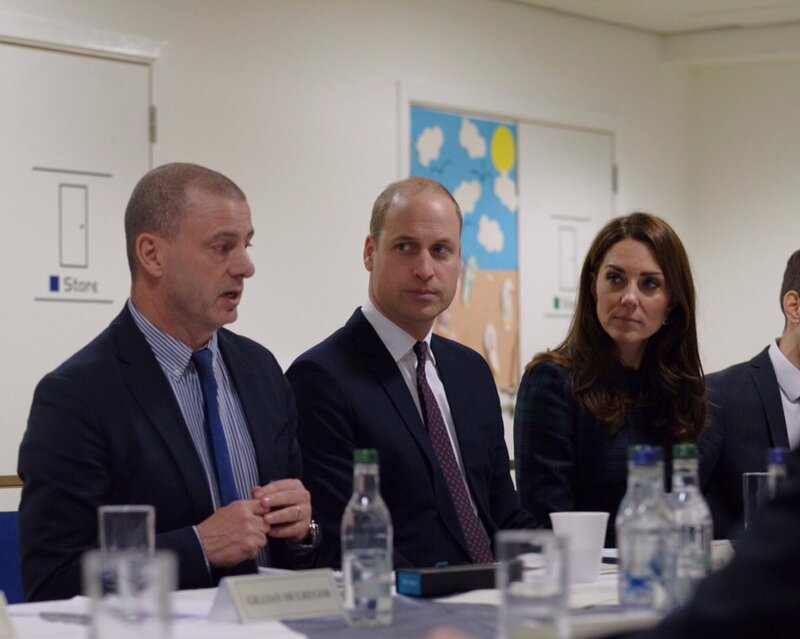 As per Lizzie Robinson, during the meeting William said, “The factory has been a huge part of Dundee’s very fabric. It has been a key employer for generations, and has helped sustain the local economy for nearly 50 years. For everyone affected, the hope is that all of you sat in this room can find a positive way forward”. 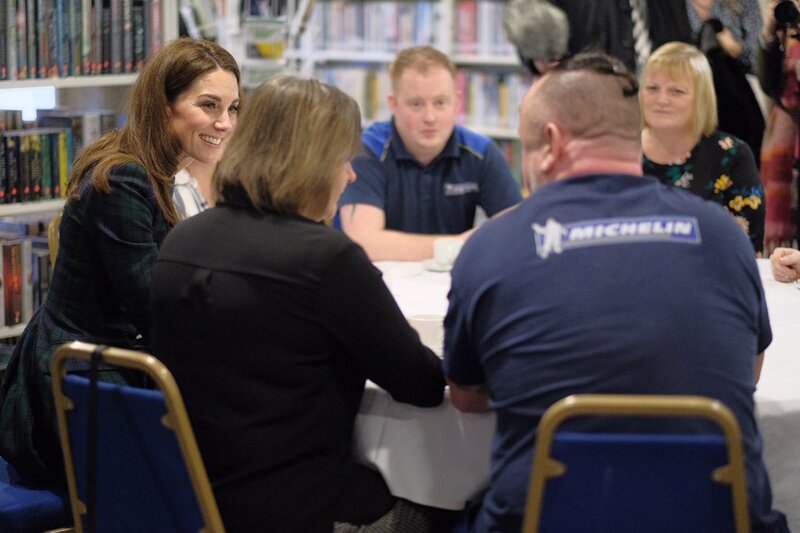 Next the Duke and Duchess of Cambridge attended the Michelin Action Group, which is aiming to find and take forward solutions for re-purposing the plant and providing a sustainable future for its skilled workforce. The action group meets regularly and includes representatives from the local council, the Scottish and UK Governments, Union officials, Scottish Enterprise and Michelin. 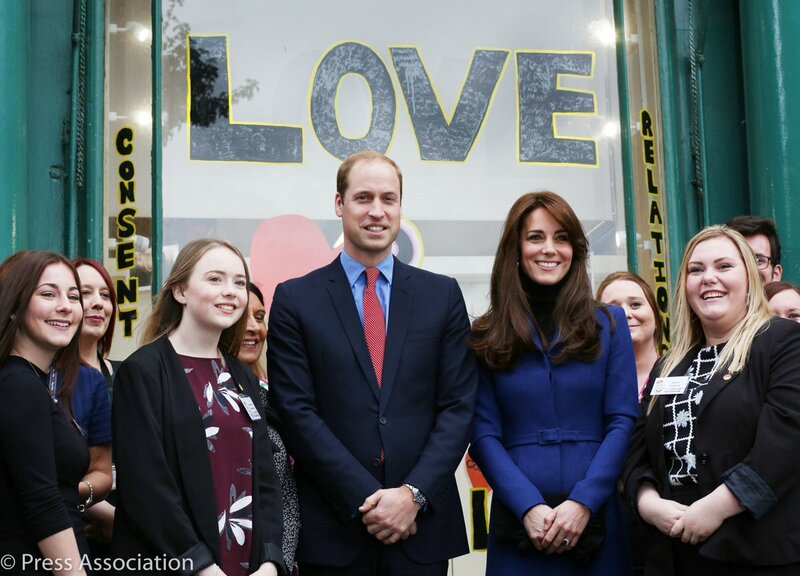 Kensington Palace wants to do this sort of visit more often, particularly as William and Kate, along with Harry and Meghan, have campaigned for better understanding of the variety of causes of mental health problems. There is much to commend Dundee to visitors but whatever steps forward this city took with the opening of V&A Dundee and the regeneration of its waterfront, the prospect of losing so many good jobs will set this place back. 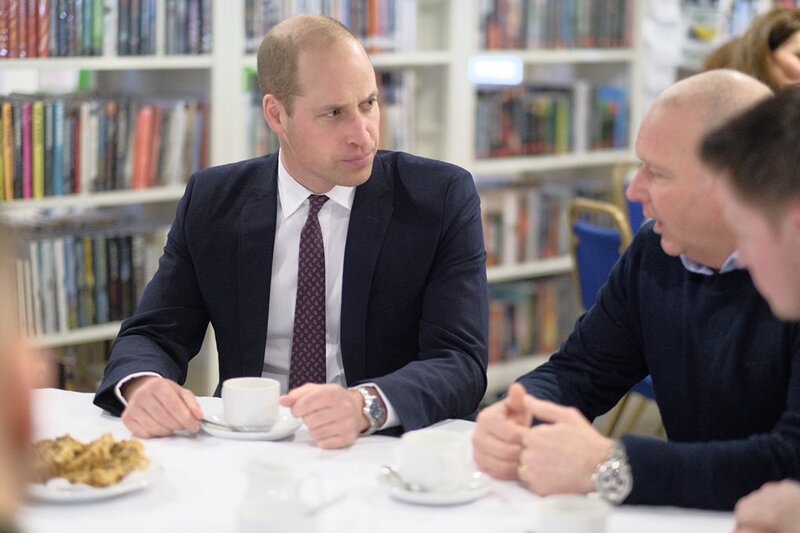 That two senior royals should want to hear about tough times facing a group of workers – as well as celebrate British success – is a welcome step. 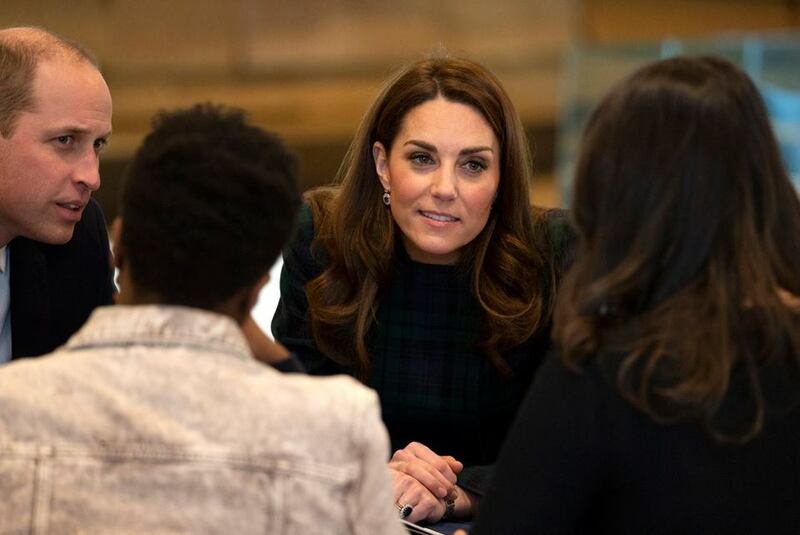 Lessons from history show us that the better the Royals connect with all citizens, in all walks of life, facing good times and bad – the better they will understand the people of the UK, on whose support the institution of Monarchy ultimately relies. 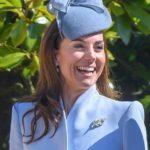 Coming to the day’s fashion and style choices, as expected Duchess of Cambridge chose to pay a sartorial tribute to the Scotland. 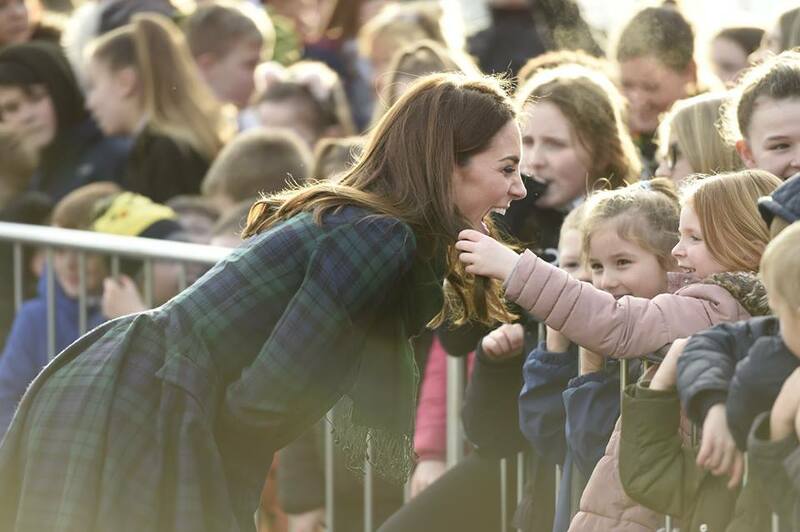 She brought back her custom made Alexander McQueen Black Watch Tartan Coat, that she first wore in October 2012 during the visit to her old school St. Andrews, just before announcing her first pregnancy. 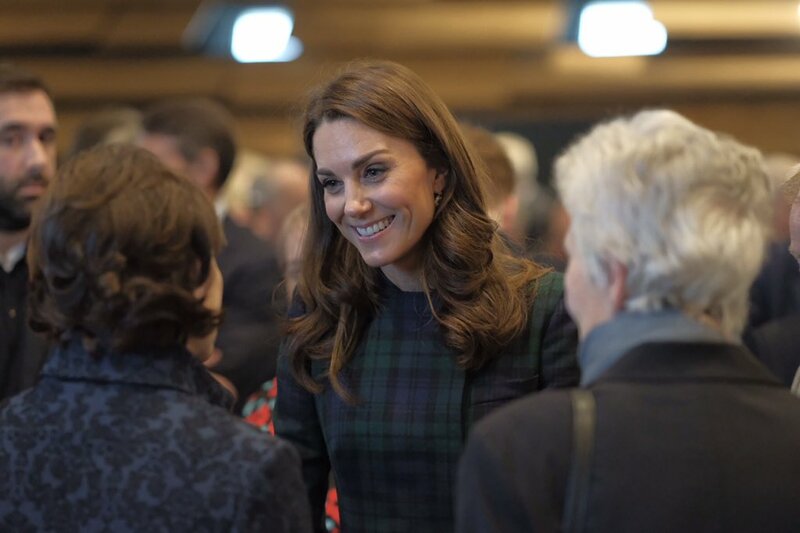 Duchess again wore the coat during 2013 Christmas Church Service. 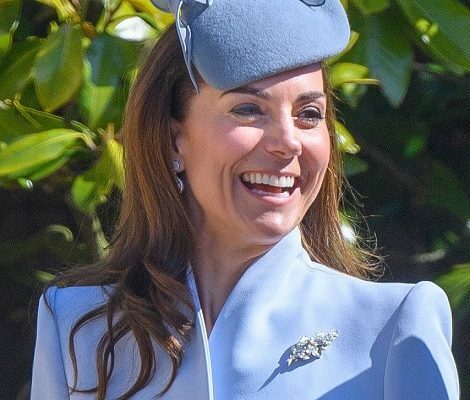 Yours truly tweeted few hours before the visit wishing that Catherine will bring back this coat dress and the wish was granted. The coat features many similar elements of label’s Fall/Winter 2012 $7220 Black Watch Coat that is still available on Net-a-Porter. 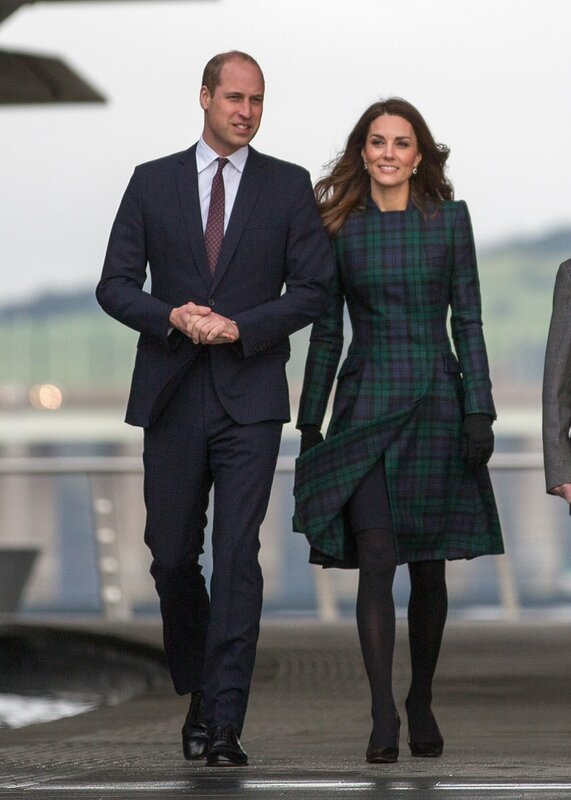 Catherine paired the coat with a black sheath dress and her trusty Tod’s black suede block heel pumps. The new element of today’s look was the hand bag. Duchess was carrying green suede/leather combination Manu Atelier Green Micro Bold Shoulder Bag. Huge thanks to UFO No More on Twitter for quick id. The £435 bag is already out of stock. 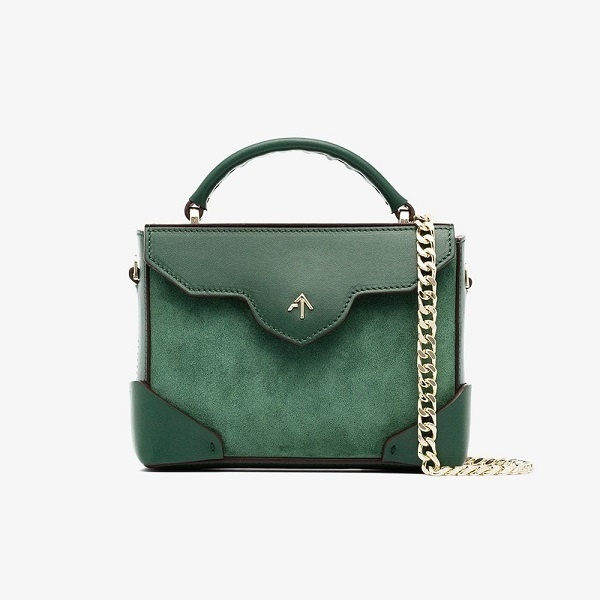 The bag is described as, ” This green Manu Atelier Micro Bold leather shoulder bag has been handcrafted with vegetable tanned leather, features a suede body, textured lining and interior zipped pocket. This one will be handy for our work trip in business class, as Winston Churchill once said, “Keep calm and carry on.” More tranquilising than Valium, this green Manu Atelier Micro Bold leather shoulder bag will send us to our happy place”. Bag is available in pure leather. 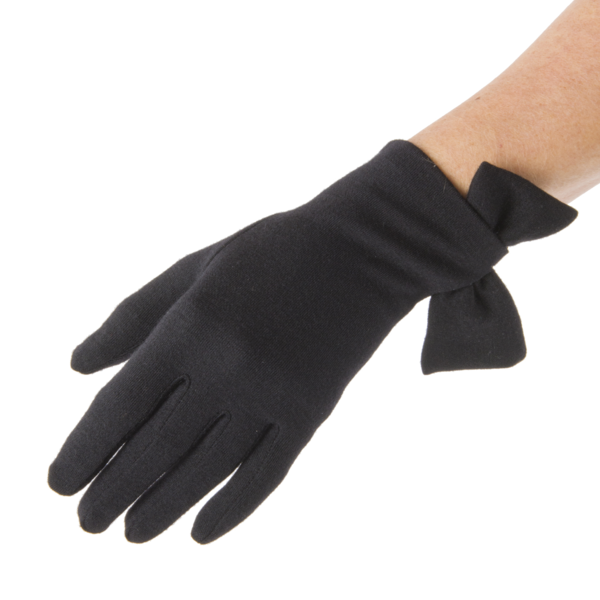 Duchess kept the harsh winter away with her Cornelia James Imogen Gloves and a green stole that is an older piece from Catherine’s pre-wedding Wardrobe. 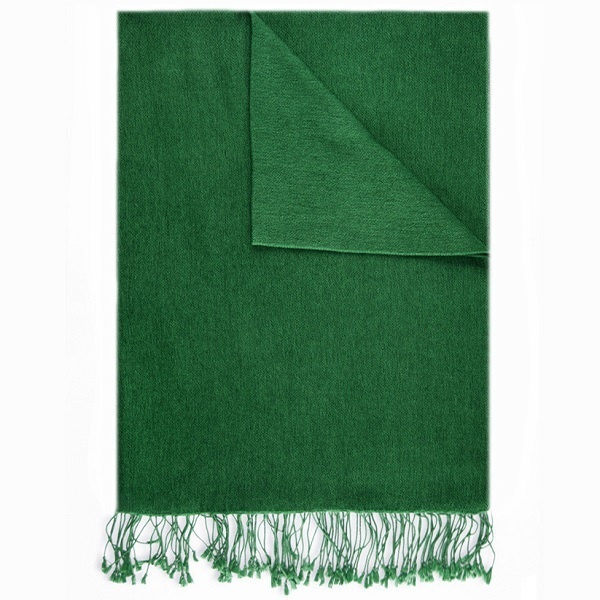 Middleton Maven suggested that it could be Pickett London’s Pashmina Stole in Emerald. The £135 stole is now available for £95. 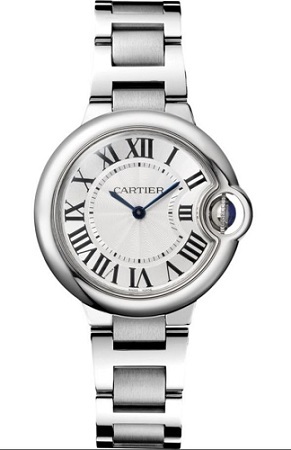 Duchess finished her look of the day with Diana’s Sapphire and Diamond Oval earrings and Cartier Ballon Bleu Watch.